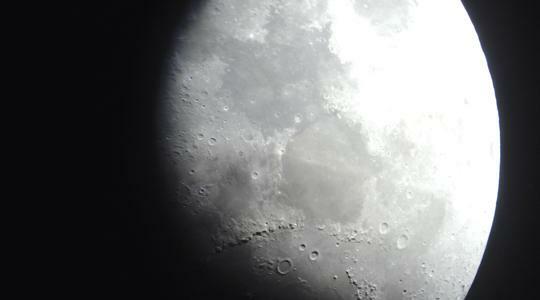 So close, yet so mysterious: A picture of the moon taken by a student. Students, teachers, and parents from St Paul's Missionary College, Rabat, the Girls' Secondary School, Rabat, which forms part of St Nicholas College, and St Ignatius College Boys' Secondary School, Qormi, recently came together to explore the skies during an astronomy evening at Dingli Cliffs organised with the help of Saviour Grech and his colleagues the Astronomical Society of Malta. We had been planning this for a long time - waiting for the right date and hoping for the right weather conditions to be able to see the moon, Saturn, Mars and other celestial bodies. Any occasion that enhances our teaching arouses students' interest in learning and invites them to conduct research, fulfils our role as educators. Bringing together such a diverse learning community as that mirrored by the three schools made the event even more meaningful and interesting. Students shared their classroom experiences, discussed material studied during their physics lessons and listened to talks by well-informed society members. Through two telescopes set up for the occasion the participants were able to observe the craters and mountains on the moon, and from the shadows they cast on the moon's surface, the participants were also able to get an idea of their depth and height. Saturn was also clearly visible, giving students the opportunity to take excellent pictures using the telescope and digital cameras. According to the Philips Guide to Stars and Planets, although the moon is officially ranked as the Earth's only natural satellite, it may be better regarded as a companion planet to our Earth, since it is relatively large. Saturn never ceases to amaze students and teachers alike. Even through a small home telescope one can observe the second largest planet in our solar system with its ring system. It is hard to believe, but Saturn is made up mostly of the gases helium and hydrogen, and its density is so low that if we could place the planet in water it would float. Next year is the International Year of Astronomy, coinciding with the 400th anniversary of the first telescopic observations made by Galileo Galilei so we hope that similar events will be organised during the coming scholastic year.